Did you know? On average, each one of us produces 4.4 pounds of solid waste each day. This adds up to almost a ton of trash per person, per year. And, Americans use 85,000,000 tons of paper a year; about 680 pounds per person. * With around 20.5 million students attending American colleges and universities as of 2016**, there's around 61,500 tons of refuse or recycle to be removed daily from colleges and universities across the US. How can all of this be handled? The Sani-Tech Auger is the answer! When it comes to disposing waste, universities face their own specific challenges. While students and staff still produce the same types of garbage as the rest of America, they also commonly have programs such as veterinary schools, medical schools, and tech schools; dealing with alternative waste means having to safely dispose of infectious waste, hazardous chemicals, electronics, sharps, even animal waste. And they need to do it all in a way that is safe and sanitary. What Makes University Compactors Different? The ST524, ST1040/30, ST1046/36 and SC1040/30 Auger Compactors have high-density bins that handle a steady stream of trash, waste, and recyclables. With a longer and stronger auger shaft and heavier gearbox and bearings, there's nothing these bins can't handle. These Commercial Compactors are designed for high volume recycling of cardboard and bulky material compacting. With bin sizes ranging from 15 - 28 feet and a capacity ranging from 4,100 - 7,200 pounds, Sani-Tech System's bins suit any school's needs. Don't just take our word for it, see what the University of Minnesota had to say about compactors from Sani-Tech. Your school's carbon footprint is reduced when using a Sani-Tech Auger Compactor. Our all-electric rotary drive eliminates the use of hydraulic fluid, along with the risk of contamination, line breaks, leaks and filters. Our all electric approach means your machines produce zero emissions and run quietly. This ensures your students, staff, and communities near the university are not disturbed. 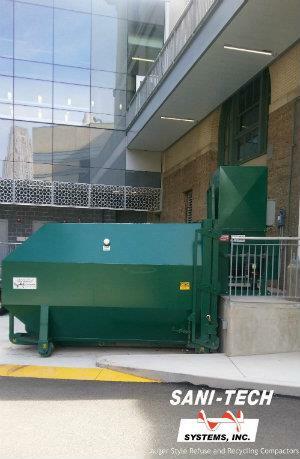 Need an Auger Compactor for your university? Call us at 800-467-7336 or fill out our contact form. Built 100% in the USA, Sani-Tech is dedicated to providing the highest quality compactors available with the best service possible to our dealers and end users.